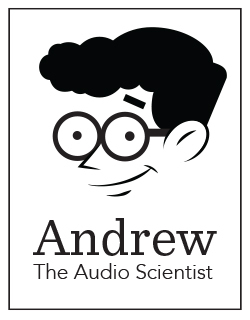 Andrew the Audio Scientist here, and today I’m presenting part three of my How to Succeed at Audiobook Production series. Let’s dig into one of the most important, yet least understood aspects of audiobook production: Mastering. But before we tackle that, make sure you’ve done proper editing and QC passes on your raw audio. Check out last week’s post for more on those important steps, and read on for my advice on audiobook mastering. Before we get to the video below, I want to remind you of the key to producing reliably great sounding audiobooks, especially in the mastering stage: consistency. Mastering is, in essence, the process of bringing your files closer to one another in terms of sound quality and dynamic range, so the listener will enjoy a book which sounds the same all the way through. The most important thing to remember about mastering is that it is done not to make a poor recording sound good, but rather to make a good recording sound great. Mastering, like editing, is a key aspect of the perceived professionalism of your production. While the average customer is not thinking about the mastering of a title while listening, the boost of clarity and consistency your narration receives from a proper master cannot be ignored. So, while the process of mastering an audiobook may appear cryptic at first, it is essential to achieving an optimal sound quality for your production. Now, let’s watch part three of How to Succeed at Audiobook Production, and after, review the mastering tips I suggest below. Assess all audio files to ensure no peaks or clipping exist in the audio. A good recording and careful editing are both necessary to achieve this. Remove all unnecessary low and high frequencies to clean up the sound of your recordings and provide more headroom in order to boost your files levels effectively. This is a great way to minimize hum and hiss in an otherwise good recording! Check the audio after mastering to ensure the operation did not over-process or under-process the recordings. Remove low (80hz and lower) and high (16kHz and higher) frequencies by using a high-pass and low-pass filter, respectively. Set the high-pass filter to remove sounds below 80hz, and set the low-pass filter to remove sounds above 16kHz. If available, set the Q to the highest-possible setting for both filters. Usually, that setting is 24dB or 48dB per octave. Typically, you should normalize your peaks to -6dB. We recommend using a limiter, if available, instead of a compressor. Compression can achieve similar results, but it may also decrease the dynamic range of your vocal recording if used improperly. To properly utilize limiting on your files, start by setting your limiter’s maximum output to -3dB. Then, turn up the gain on your limiter until you have achieved a loud, clear, and consistent sound. Don’t boost the level too high. Otherwise, you may distort your voice, or bring up the noise floor of your recording too much. Remember: the better your recording and editing, the easier this process will be! If you have not yet read the first and second parts of this blog post series, I strongly recommend you do so. It can greatly reduce the workload involved in mastering your audiobook. Before you begin mastering, record and edit the entire audiobook to completion. Then, make a final “completed edits backup,” – which I refer to in my prior blog post on file management – of each chapter. Maintaining a backup file is imperative, in case you discover any issues with the audio while mastering. A good recording is everything. Prior to mastering, a well-recorded audio file will have an RMS value no greater than -28dB RMS and peaks at a level no higher than -12 dB This provides the headroom needed to boost the volume of your production without needing to compress the signal heavily. If your peaks are already nearing -3dB before mastering, make sure no loud noises remain in the audio. If no erroneous sounds are found, then it’s likely you recorded too loudly. This is why learning how to properly prepare for and record your narration is essential to performing a successful master. Plugins cannot help an inconsistent or noisy recording. Some people attempt to fix deficiencies in their recordings or their editing by using noise reduction plugins and gates. Software like this can be effective if used properly, but more often than not, the use of such plugins will cause more harm than good on an audiobook production. I strongly recommended you take the time to focus on your recording environment, as well as your recording and editing techniques, so you do not need to resort to the use of such software. It will save you valuable time as well as money – those plugins can get expensive! In order to group your audio files together effectively, leverage the audio measurement tools available in your DAW to find the audio files that are similar to one another. If you are an Audacity user, the “stats.ny” plugin will be essential to performing this task. See this thread from the Audacity forums for installation and use instructions. Most DAWs have a similar capability, so if you are not aware of what tools can be used to achieve these actions in your particular software, contact the manufacturer to receive assistance in their use. Double-check your masters. Use the same function on your DAW that you used to group your pre-mastered files in order to check your new mastered files. If your audio measurements fall within the ACX Audio Submission Requirements, you should be good to go, which brings us to our final step. Verify the following ACX Audio Submission Requirements. Are all of your files’ peaks hitting around -3dB? Is each file’s average RMS between -18 and -23dB RMS? How audible is your noise floor at normal listening levels? There’s no shame in attempting a second master if you’ve found flaws in your new mastered files – that’s why you saved your Completed Edits Backup files after you completed your edits. In truth, the most important mastering tip I can impart upon you, is to try, try again until you get it right! Mastering is very much a process of trial and error until you learn the tips and tricks that suit your production environment. Once you find settings for your mastering chain that work well for your voice and recording space, remember to save the configurations as presets so that you can easily reference them for your next ACX title. If you’ve established a consistent workflow for the recording and editing stages of audiobook production, then your mastering workflow will be a piece of cake! Do you have mastering tips that Andrew didn’t cover here? Share them in the comments below, and join us next week for the fourth and final part of Andrew’s series: encoding and file delivery. This entry was posted in Actors + Studio Pros, Audio Scientist, Videos and tagged actor, ACX, acx mile, audio scientist, audiobook creation, Audiobook Creation Exchange, audiobook mastering, audiobook production, audiobooks, how to succeed at audiobook production, mastering, producer, production advice, studio. Bookmark the permalink. While it’s probably a good idea to discourage most people without a lot of experience to avoid gating, I think to imply that “it’s wrong to ever use gating at all” is a bit specious. The use of an audio gate can do wonders for a recording, *if* done with restraint and subtlety. Especially in a less-than-pristine recording session (or overall recording environment). The problem arises when it’s used in such a way that you can obviously *tell* that a gate has been employed — whereas, used properly, its application should be almost completely transparent. And obviously, the utilization of a gate also requires the use of room tone, so that your floor doesn’t simply drop away to zero dB. So, yes, I agree that most of the people who employ gating don’t do it properly, but it can be a godsend for those people who use it discriminately. I’m curious: What is the objection to a de-esser? I agree with DJ about gating. I learned a “master as you go” method from an engineer on my first audiobook, and monitor myself through my de-esser, mild gate, and limiter. If used properly and subtly a gate works well. It will not, however, actually remove background noise while the gate is open (ie: while you are speaking). And aggressive settings yield the kind of pumping and breathing that no doubt led to this recommendation. The key is: If it sounds like you’re using a plugin, you’re probably using the plugin wrong. Did you intend that “no” to be there? Shouldn’t that read: If erroneous sounds are found, then it’s likely you recorded too loudly. If, prior to mastering, you find there are peaks caused by erroneous sounds, edit them out. If the peaks are not caused by specific sounds that can be edited out, then one will need to improve at the recording stage, because either your room tone is too loud or the voice itself is causing the peaks. Thanks for the information, but I was pointing out a grammatical ambiguity in your sentence, not asking for clarification. Steven, he was telling you, “No, it is not a grammatical error” by explaining to you what he meant. If there ARE erroneous sounds, then the high peaks may be caused by those sounds. If there are NO erroneous sounds, then the peaks are probably due to recording too loudly. Before you sit down to a mastering session, listen to a comparable genre sample that you love. Listen to a book that you think sounds GREAT as a listener, and let it help tune your ear. Spend a good 5-10 minutes just, getting into the mindset, then start your mastering session. Also, while editing is best done with headphones, it can be a good plan to try mastering on monitor speakers, and preferably a couple of different TYPES of monitoring speakers/headphones. Your goal is to make a stable, appealing, quality listen for a user on a variety of platforms. Andrew, is there some tool on Adobe Audition which does a similar report to the stats.ny plugin for Audacity? That looks like a great tool, and I’d like to have an “at a glance” report from Audition if possible. It contains a user guide for an Adobe Audition feature that behaves in an equivalent manner to stats.ny. The tool is even more feature-rich, though, as it can also let you know if any clipping was detected in the recording! The values that you will want to be looking at are “Peak Amplitude” (to measure the highest peak values in the recording) and “Total RMS Amplitude” (to get an approximation of your recording’s dynamic range). Remember that your peaks should be not much higher or lower than -3dBFS, and your RMS should measure between -23dB and -18dB. Thanks Andrew! It turns out there is a whole workspace layout for mastering in Audition. That is very useful for me. Thanks again for a great series. My recorded audio pre-mastering always has a high RMS. Even when my gain is set so I’m hitting my peak amplitude of “no more than -12 db”, my total RMS amplitude is in and around -40. I’m using audition. Adobe Audition does have several RMS-related measurements that can be displayed. The “Total RMS Amplitude” measurement is the one you’ll want to be looking at. An RMS of -40dB is actually a rather “low” measurement, in that it indicates a quiet audio file. A measurement closer to 0, such as ACX’s minimum requriement of -23dB, would be a higher RMS measurement. If your pre-mastered recordings are peaking at -12dB and have an RMS of -40dB, then you are on the right track! When a file is in this state, the first step should be to normalize the audio. Normalizing your audio file to -6dB should cause the overall volume to increase, but it may not impact your RMS that much. If your RMS is not yet falling within the required -23dB to -18dB range after performing the normalization, your next step should be to increase the gain of your audio file until the audio is peaking around -3dB. If that still doesn’t get the RMS up to the required range, following the “Compression/Limiting” section of this blog post should get you up to spec. I can relate to Eliza. I’ve done lots of VO work and radio but never had to be so precise with submissions. Thanks so much for laying it all out so clearly in this blog series. I’ve been gradually learning pro tools, but I’m having an issue finding were to look to analyse the track to check that it falls within the ACX submission requirements. i.e. where the RMS and peak measurements can be found and where you can check the noise floor. I’m still so confused by normalization and compression/limiting. I do a thorough edit. But after I normalize, new mouth clicks show up. WHY is louder better? Well done Andrew, thank you. Having half of my book recorded and edited and looking ahead to not only completion of that, but also mastering, QC and encoding; it’s good have your words, tips and examples as my marching orders. Thanks again. I do have a question for you though Andrew. I am narrating a non-fiction book. There are 2 places where I want the audio to be emphasized differently than the rest of the recordings. In editing I did these few lines with reverb, the mildest effect… is this ok to do? thanks. Help!! I’m sure I can’t be the only person having this problem. Ok, so I know all about the RMS value, peaks, compression, etc. The problem I’m having is there are two RMS numbers in my statistics plugin: The normal RMS value and the weighted RMS value, which is quite a bit lower. I’m having trouble getting both the peaks and RMS values in the required range, unless I’m supposed to be taking an average of the RMS and weighted RMS value? Specifically, the problem I’m running into is that my peaks are too low and my RMS values are too high. It’s almost like the file is compressed, but it isn’t. I actually need higher peaks, and that would solve the problem. Hi Jason! What statistics plugin and DAW are you using?